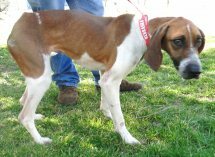 Great news -- Daisy has been rescued, but ROGER and the other hounds are still desperate for homes. Please Chipin or contact Star below if you can help. WHO IS SHE? Her name is DAISY. *From J: Daisy was found standing on yellow line in middle of highway in rural area investigating road kill. She is very skinny with all bones protruding through skin, pressure sores and her weight is currently 35#. She is about 1 1/2 years old, very sweet and submissive. She was wearing plastic orange collar with partial chain hanging from it. Jan picked her up and stopped at nearest vet who checked her out, heartworm tested (negative) and gave her rabies and DA2PPv shot. Girls at vet named her "Daisy" (from skunk in Bambi) because she had been skunked. STAR has many many hounds and this girl needs TLC, not the Pound or kennel. THESE OTHER HOUNDS NEED HELP TOO: NO ONE is even looking at our hounds right now. We have had Roger since November!!! Roger is wonderful and getting depressed. A decision may have to be made if help does not arrive for him soon. He is fully vetted, HW neg, and good with cats and dogs yet no one has even asked about him. He is a big boy and has been at the kennel too long now. We have Lil, Franz and Hanz, the pyr/hound mixes we are helping a dear lady with. All 3 wonderful dogs. They are listed on the website. They are sponsored to approved rescue. We have a stunning male coonhound at the vets. He is truly gorgeous! We have some nice hounds facing death at the pound. We need donations for vet bills and transport. I think the bill on this starved girl below was only about 60 bucks for her exam, rabies and HW test. She is amazingly HW neg. PLEASE CROSSPOST TO REPUTABLE HOUND FOLKS!!! !